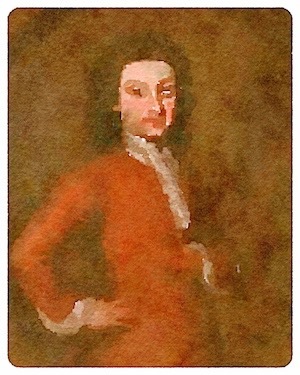 British naval officer and explorer Philip Carteret (1733 – 1796), the younger son of Charles de Carteret, seigneur of Trinity Manor, was fourteen when he left Jersey to embark on a naval career. He started as an officer's servant aboard the Salisbury, then followed John Byron through successive commands: the 50-gun fourth-rate HMS St Albans (1751 – 52), the 60-gun fourth-rate HMS Augusta (1753) and the 70-gun third rate Vanguard (1753 – 57). He passed his Lieutenant's examination in 1755 and served on the 48-gun fourth rate Guernsey on the Mediterranean Station (1757-58). While he could have left the Navy after he inherited the family estate when his elder brother died in 1761, Carteret remained at sea and, as a lieutenant in the Dolphin, he took part in John Byron's voyage of circumnavigation (June 1764 – May 1766). On the Dolphin's return, Carteret was promoted to Commander in May 1766 during the three-month turnaround between his old ship's two circuits around the globe. Carteret was given the command of the decrepit, poorly fitted out, and undermanned fourteen guns sixth-rate sloop Swallow to accompany Samuel Wallis in the Dolphin on another venture into the South Pacific. Carteret was perfectly aware of his new command's inadequacies and lost no opportunity of advising his superiors of them, but while his complaints brought a few improvements, they probably damaged his subsequent career by souring his reputation among those who allocated commands and professional opportunities at the Admiralty. Carteret's concerns centred on the thirty-year-old sloop's seaworthiness, believing that she would be hard-pressed to reach the Falklands let alone make the tortuous passage through the Straits of Magellan. Requests for equipment were refused, and concerns about supplies produced assurances that they had been provided and were available from the Dolphin and the storeship that would accompany the two warships. By the time they reached the Straits of Magellan, where it took seventeen weeks of struggle against strong and contrary winds to make the passage, the under-officered and ill-equipped Swallow continuously lagged behind her companions. When Carteret urged that she should be sent home, Wallis replied that their orders tasked the Swallow with accompanying the Dolphin, so she would have to do so for as long as possible. While he assured Carteret that he would when Swallow fell behind, and offer assistance if necessary, Wallis disappeared three weeks later. Off Cape Pillar at the western exit of the strait the conditions which discouraged Wallis from waiting in the vicinity. Wallis, was, in effect, set free from the delays that came with waiting for the Swallow but to Carteret, his disappearance bordered on desertion, but the combination of the weather conditions and the different sailing qualities of the two vessels probably made the separation inevitable. While Carteret'ssuspicions that he had been deliberately abandoned were probably unfounded, they did nothing to mitigate his sense of grievance. After four months in the Straits, however, he was not inclined to repeat the experience and resolved to press on. Remarkably, both vessels went on to complete their voyages independently. Carteret did not manage to clear Cape Pilar until 15 April, four days after his separation from Wallis. Short of water and supplies, he headed for the former buccaneer's lair at Juan Fernandez. He arrived at Mas Afuera, the most westerly in the group on 9 May and moved on to the main island next day, to find it had been occupied by the Spanish, who had secretly built a substantial fort on the island. On that basis, he had little alternative than return to Mas Afuera, where he remained until 25 May. From there, given the Spanish presence on Juan Fernandez, he investigated the rumoured islands of San Felix and San Ambrose, on the basis that they might prove useful assets in British hands. While he did not manage to locate them, Carteret was the first to suggest that they might coincide with Davis Land. As he tracked westward across the Pacific, Carteret found it was impossible to steer due west, and some degree of northing was inevitable. Still, he managed to follow a course to the south of previous tracks and to the south of Wallis, who was in the process of making his sole significant discovery at Tahiti. Carteret's first discovery, on 2 July, was Pitcairn Island, later to become home to the Bounty mutineers, though it was uninhabited at the time. From there, he encountered what he named the Duke of Gloucester's Islands in the Tuamotus on 11-12 July. One of them was Mururoa, later the site of French nuclear tests, though it appears on Carteret's charts as Bishop of Osnaburgh Island. His next encounter, on 12 August Queen Charlotte's Islands (later the Santa Cruz group) was a rediscovery. The island he named after the Admiralty's First Lord was, in fact, Mendana's Santa Cruz, now Ndeni, discovered in 1595, unsighted in the interim and about to deliver the scurvy-ridden crew a significant problem. The Swallow's master took an axe to a walnut palm, the local people objected, there was a flurry of violence and the master, Alexander Simpson, and three other men received fatal arrow wounds. The deaths were probably due to tetanus rather than poison, but losing the master left only two men aboard the Swallow to look after navigating them to the East Indies. Carteret pressed on towards Dampier's New Britain, skirting north of the Solomons but out of sight of them until he encountered a cluster of islands off Bougainville's northern tip which he failed to recognise as islands first sighted by Álvaro de Mendaña in 1568. Arriving at New Britain on 26 August, he discovered a second island, named it New Ireland, named the strait between the two St George's Channel. The passage between New Ireland and New Hanover became Byron Strait on the charts. After landing at Gower’s Harbour the Swallow's crew spent a week at English Cove, where there were native huts, but no inhabitants to object as dozens of palm trees were cut down for their nuts and ‘cabbage'-tops. While the crew was desperately weak, they mustered enough strength to careen the vessel and make running repairs before they sailed on 9 September. Sailing on, Carteret reached Mindanao, via the Carolines, and finally arrived at the Dutch port of Makassar in the Celebes in mid-December. Desperate for supplies and proper facilities to repair his ship, Carteret was greeted with suspicion by the Dutch authorities, did not help his situation when he entered into dealings with dissident local rajas through an English adventurer, but eventually, after a five-month stand-off which nearly ended in violence, he sailed for Batavia. There was another grudging reception and more delay when he reached Batavia in June 1768, though the Dutch were more amicable when he arrived the Cape on 23 November 1768. A meeting with Bougainville’s la Boudeuse, north of Ascension Island marked the last homeward leg. Both commanders were keen to extract information from the other without disclosing anything of value themselves. Carteret was back at Spithead, weakened by severe illness, on 20 March 1769, largely thanks to the efforts of his Lieutenant, Erasmus Gower, who was while his captain was indisposed below deck, the only person aboard the Swallow who could attend to the navigation. With his health ruined by the voyage, and without the patrons who might help him into another command Carteret received little reward from the Admiralty where his complaints before the Swallow departed ensured that requests for another command fell on deaf ears. On half pay, he returned to Jersey in 1770 as seigneur of Trinity, took part in island politics, married, and organised a petition to have naval half pay increased. The latter exercise proved of some benefit to some officers but not to the petitioner. In the meantime, in 1773, his journal had been handed to editor John Hawkesworth and appeared in print as part of An Account of the Voyages undertaken by Byron, Wallis, Carteret and Cook (1773). Like Cook, who went on to supervise the publication of the journal from his second voyage, Carteret was angered by Hawkesworth's ill-judged editorial changes. While he prepared his version of the journal for publication, it remained on the shelf until a Hakluyt Society edition appeared in 1965. HMS Endymion, in August 1779 on a voyage to the West Indies via West Africa. After some misadventures in the English Channel and off Senega and a hurricane in the Leeward Islands which nearly accounted for him, Carteret eventually returned home in July 1781 having captured the 60-gun French Indiaman La Marquise de la Fayette en flûte (without guns mounted) in May. Despite having a share in a total of four prizes, to his astonishment and mortification, Carteret was paid off, and his ship transferred to another captain, Edward Smith. Subsequent unsuccessful petitions for a new command increased his bitterness. He suffered a stroke in 1792 and eventually retired to Southampton, where he had lived since 1780, with the nominal rank of Rear-Admiral in 1794 and died at home on 21 July 1796. Though he died disappointed and embittered, was unquestionably the victim of ill fortune, and had his reputation marred because Hawkesworth's mangled version of his journal was the only account of his voyage, Carteret’s geographical contribution was notable and a fitting testimony to his courage. He had shaved off a slice of the area where Terra Australis might lurk, found Pitcairn Island and cleared up the geographical relationships of islands to the north of New Guinea, and done all of it in a vessel that seems to have been unseaworthy for much of the circumnavigation. While Carteret's inflexibility and a reported tendency to harbour resentments contributed to his subsequent disappearance from the historical radar, his achievements were eclipsed by the triumphs of Cook's triumphant return from his first circumnavigation in 1772 and the momentous results on his second and third voyages. Sources:Felipe Fernandez-Armesto (ed.) The Times Atlas of World Exploration; Felipe Fernandez Armesto, Pathfinders: A Global History of Exploration; Elizabeth Baigent, Philip Carteret (1733–1796); Chambers Biographical Dictionary; Colin Jack-Hinton The search for the islands of Solomon 1567-1838; G. A. Mawer Incognita: The Invention and Discovery of Terra Australis; Michael Pearson, Great Southern Land : the maritime exploration of Terra Australis; Andrew Sharp, The Discovery of Australia; O.H.K. Spate The Pacific Since Magellan, Volume III: Paradise Found and Lost; Wikipedia; Rif. Winfield, British Warships in the Age of Sail 1714-1792: Design, Construction, Careers and FatesPhilip Carteret (1733 – 1796), the younger son of Charles de Carteret, seigneur of Trinity Manor, was fourteen when he left Jersey to embark on a naval career. He started as an officer's servant aboard the Salisbury, then followed John Byron through successive commands: the 50-gun fourth-rate HMS St Albans (1751 – 52), the 60-gun fourth-rate HMS Augusta (1753) and the 70-gun third rate Vanguard (1753 – 57). He passed his Lieutenant's examination in 1755 and served on the 48-gun fourth rate Guernsey on the Mediterranean Station (1757-58). Carteret did not manage to clear Cape Pilar until 15 April, four days after his separation from Wallis. Short of water and supplies, he headed for the former buccaneer's lair at Juan Fernandez. He arrived at Mas Afuera, the most westerly in the group on 9 May and moved on to the main island next day, to find it had been occupied by the Spanish, who had built a substantial fort on the island.